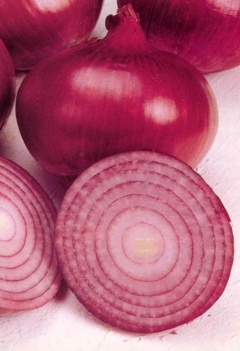 The onion is an excellent metaphor for life’s reality. Each of us peel away layer after layer as our daily experiences steadily turn into a lifetime. With each decade, we see a little deeper and become a little more humble in the process. I always keep one eye on the past and the other eye out for any hints about humanity’s possible future (1). I just peeled away what looks like another layer. Human suffering and confusion is a result of the cognitive projection of desires (need + thought) and worries (fear + thought)—no surprise there. The exponential rise in tool use, beginning perhaps 100,000 years ago, began to exasperate this situation. Tools allow us to actualize our projections of reality (i.e., our desires and worries) more effectively. This helps convince us that our projected sense of reality is all the more real. Reality becomes what we think it is, which increases our disconnection with ‘true’ reality — or as chapter 6 puts it, this is called the profound female. The evolution of tool use took on explosive proportions around 10,000 years ago with the Agricultural Revolution. The subsequent increases in free time and novel problems facilitated innovation — more tools! This accomplished our principle desire to make life increasingly comfortable and secure. Each innovation had a positive feedback effect on the tool innovation, which has resulted in exponential evolution—not of biology, but of culture and tools. Now, I don’t want to make a big deal over this. I see this as more of a blip on the several million-year evolution of Hominidae — the family to which modern human beings are only a recent iteration. What’s more, it is always helpful to keep the emergent property nature of evolution in sight. All phenomena are connected; we just see only bits and pieces of the connection. Even then, however, how do we know those slivers are not merely projections of our needs and fears? Therefore, the view is naturally tenuous. As chapter 21 has it, Of the way serving the outside world, only suddenly, only indistinct. Nevertheless, seeing this ‘outside world’ as layer upon layer, symptom upon symptom, helps avoid becoming trapped in the story. 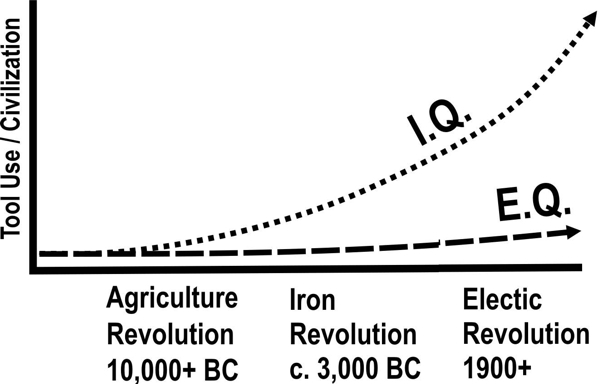 Evolution of I.Q. — Devolution of E.Q.? The rapid innovation and change that the agricultural revolution permitted destabilized every facet of human life: language, family, life style, etc. Civilization was the only apparent solution, the only way we could possibly have our cake and eat it too! This brought our I.Q. (intelligence quotient) out of sync with our E.Q. 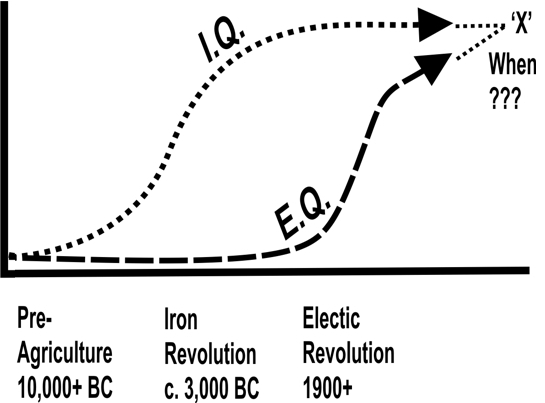 (emotional quotient) The I.Q., is a standardized measure linked to culture and civilization. It is largely a function of circumstances and education, and changes as those factors change. E.Q. (emotional ‘intelligence’) is a function of our biology and not subject to ‘education’ per se. However, E.Q. can be significantly crippled by early childhood distress or through severe trauma experienced during adult life. (graph: [tool use / civilization]: our long journey out of ‘eden’). Improvements in E.Q. only occur gradually, naturally, through the experience of aging. As we age, our I.Q. and E.Q. come closer together—in sync (see chart right). 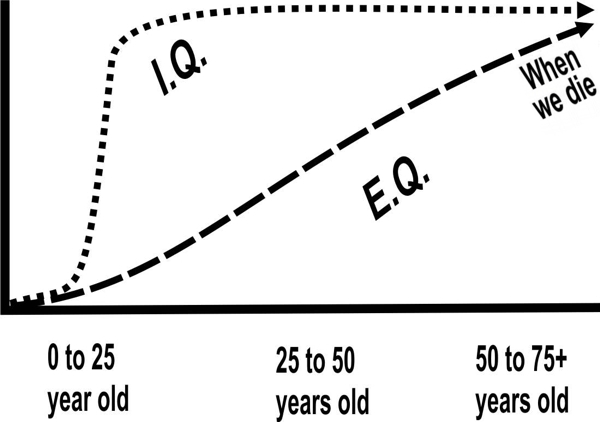 The major experience factor that raises E.Q. is the pain, sorrow, failure, and disappointments in life that arise from our hope for the opposite. As Buddha said, “pleasure are the bait, the result is pain”; that pain deepens E.Q. The object of civilization has been to dampen down aspects of our instinctive nature to produce a pseudo higher E.Q. to match our higher I.Q. cultural circumstances. I suspect one principle reason our instincts started getting in the way of natural harmony is because larger numbers of people—the masses—gathered together, first in villages, then in cities. Absent was the intuitive trust that comes from living life from birth to death with the extended small ‘family’ that is tribal life. The increased free time and technology only exasperated the alienation. Human existence became a more ‘me’ than ‘we’ experience. Religion is no accident. After all, necessity is the mother of invention, and religion is a human invention. Much in religion conveys the express purpose of extinguishing our ‘animal nature’. To rise above ourselves, morally speaking, and live a virtuous life has been the goal. To “love your neighbor as your self” simply reflects a need to recapture an extinct ‘hunter-gatherer’ tribal trust. History shows how ineffective this is. We are virtually strangers to each other, with cultural etiquette and morality glossing over the inherent disconnection. Common music, food, clothes, religion, sports, politics, all serves to reinforce the illusion of connection. Granted, civilization on the surface seems to be more humane in some ways now than in the past. However, this is not because we are ‘spiritually’ changing as a species. The positive changes we see are in part a result of changing economic necessity (need). For instance, if we needed to kill whales to survive, we’d lift the bans on whale killing and we’d drive them into extinction. Changing economic circumstances merely shifts necessity. Chapter 16’s “Not knowing the constant, rash actions lead to ominous results” frames this well. Perceived necessity (need) drives Rash actions. Currently, for example, perceived necessity leads to rash actions that wreak havoc upon the environment and us (e.g. nuclear weapons, global warming, specie extinction, super-bugs). On the other hand, genuine benevolence may be increasing as well. Let me put it this way, if humanity is becoming more truly humane, it is only because the mean age of the population has been steadily increasing, especially in the developed world. The mean age of populations in developed areas is around 35 years old. At the time of Jesus, the mean age was in the teens, and civilization overall reflects that. The genocide slaughter that took place recently in Rwanda is partly due to the mean age of the population being a mere 19 years old. I suspect that if the mean age of our population were in the teens now, we would have nuked Iraq long ago. On the other hand, if the mean age of Rwanda (or any other region of genocide) were 100 years old, there would be no genocide. The ‘Electric Age’ is the most significant innovation since harnessing fire. Ironically, it may turn out that innovation returns our species to a modicum of balance, where I.Q. and E.Q. are more in alignment (see I.Q. /E.Q. graphs). Electricity has made modern science what it is today. The advances in science leading to our ever-increasing life span will double or even triple the median age of the human population from where it is now. Even if this takes a thousand years, that would be ‘tomorrow’ in real evolutionary time. Try to imagine a human population where the mean age is pushing 200, or even 100. Obviously, E.Q. then will have a vastly better chance of counteracting our high I.Q. As chapter 18 says, When intelligence increases, there is great falseness, and conversely, when E.Q. increases, there is greater self-honesty! Finally, I’m not saying that there won’t be some 100-year-old nut jobs. The point is, how many 100-year-old mostly well-adjusted people will be gullible enough to follow whatever crazy dogma the nut jobs promulgate? At 70, I am much more ‘well adjusted’ than I was at 40. In 30 years, I would be even better adjusted than now. E.Q. deepens with maturity; circumstance [and time] bring us to maturity. It is as simple as that. (1) At a low point in my mid twenties, I saw humanity as a cancer upon the earth. All we do is use the earth, give nothing back… unless it serves what we want. Correlations finally opened my eyes, grudgingly, and blew away this dismal view. Now, at least what ever I see, I know is reasonably impartial thanks to correlations. It is now impossible to maintain any faith in any biases. This leaves me neither favoring nor dismissing humanity. It is a fair tradeoff… freeing and lonely at the same time.